free sketch pad that allows you to easily document and record all important information for your photos and documents. Check it out. The Flip-Pal™ mobile scanner is on sale over the course the next week. This 7 Day sale will give you awesome discounts. 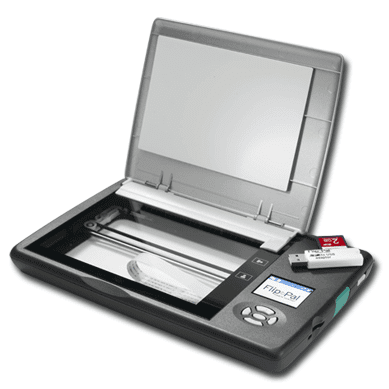 Although the Flip-Pal is an incredible deal at the standard price you might as well take advantage of the President's day sale and purchase a scanner and software package between the 15 and 22 of February 2012. The deals are great and the time is right to buy a The Flip-Pal™ mobile scanner with Creative Suite. We also now offer the Flip Pal Sketch Kit that can be used to notate your photos and documents with incredible ease. You can put he sketch sheet over the photo or document and make your notes and re scan. You will now have your photo with your notes on one scan and a clean scan as well. The transparency allows you to see the original photo or document underneath while you write on the transparency itself. Simple use the the Flip Pal to make another scan and you have record of your text on the sketch sheet that now appears as though you have written your notes directly on the photo or document but you have only written on the sketch pad and your original document is untouched. It is true that organization can help our productivity but for those whom are organizationally challenged, the time spent trying to get organized can lead to more time wasted. Often some people will need to hire a professional efficiency expert or full time assistant to help them stay organized. This is a great solution if you can afford the extra cost but now you have a few scanner options that will allow you to be much more organized with much less effort. One of the most difficult things to deal with into today's world is our large quantities of paper documents such as contracts, bills and receipts. We also may have hundreds or thousands of pictures that ideally could be scanned and load onto your computer for safe keeping. The issues of losing important papers or even just having the space to file and keep all the paper we need to keep are felt by everyone. The good news is that now you can use a portable or desktop scanner to decrease your paper clutter while getting your documents scanned to the computer. A scanner can be an efficient teacher in a matter of moments. Just being able to throw away countless copies of random paperwork after scanning them into your computer is a huge weight off of anyone's shoulders. It is well know that a clear desk will help you keep a clear mind. It will also make it easier to dust and keep clean when you have less piles of paperwork on your desk. A scanner will help you life immensely if you use it to develop the habit of scanning all your important and semi important documents. It doesn't matter whether you get a mobile scanner or a desktop scanner. All that matters is that you get one that is what you want and need at the time. So check out a few scanners before you take the leap.